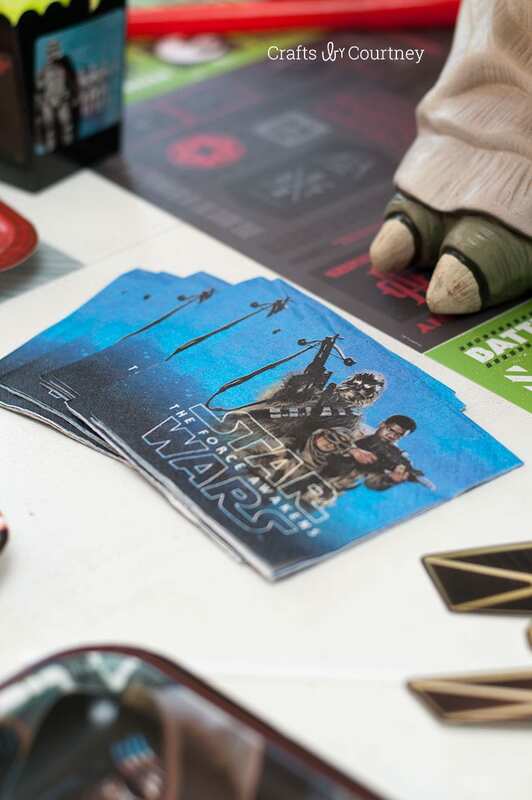 Star Wars is so big right now, especially with all the new movies that have come out. 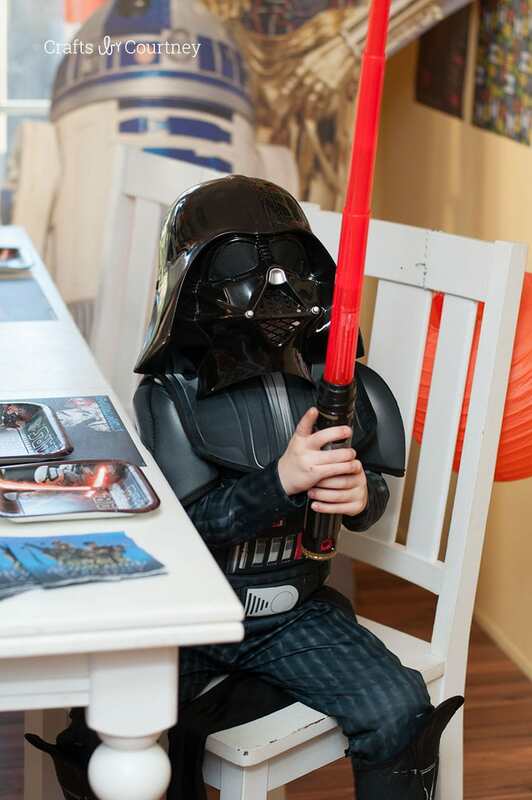 Since I have three boys I thought a Star Wars Party would be a perfect idea. 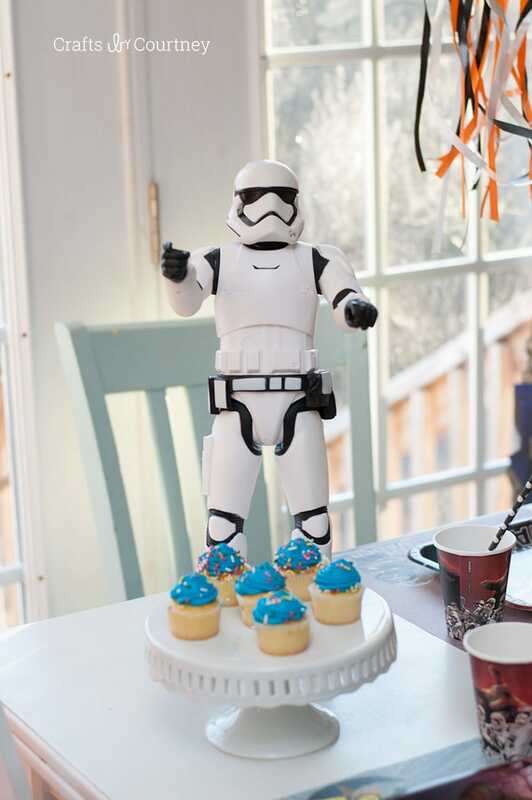 I love working on DIY parties for my family, it’s great to find ways to throw a fun party but stay on budget. That’s what I’m all about with all my parties, staying on budget. Since we decided on having a small party at the house, I wanted to decorate our kitchen table. I really think it gives it a nice cozy feeling. I also love adding scrapbook paper to all my parties at part of the decorations. It’s pretty inexpensive and now you can find about any theme you’re looking for at craft stores now. I found this pack at Hobby Lobby for $20.00 but it was %50 off, woohoo. Total score with this purchase! 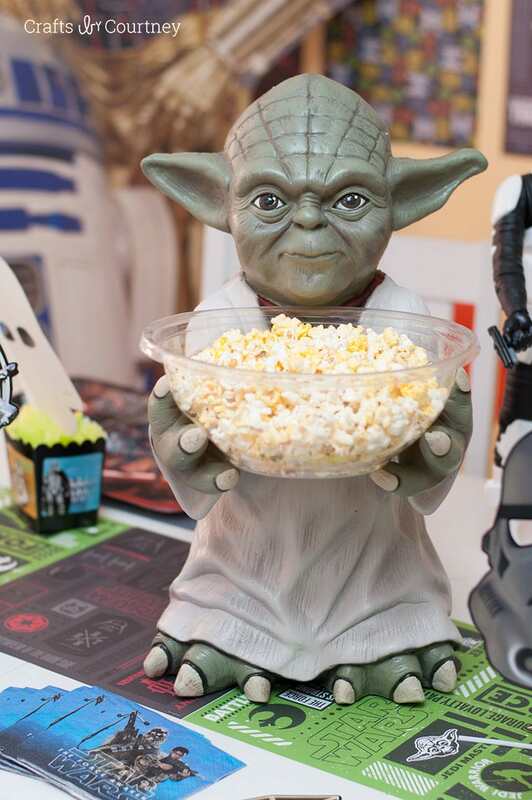 This Yoda was probably one of my favorite pieces. Just because I think my son can use it in his room afterwards. I can see him adding some crayons in the bowl for drawing. Adding scrapbook paper for the table runner is a great idea and pretty inexpensive to do. I don’t always like adding tablecloths to the party tables. I like the look of actually showing off my table. 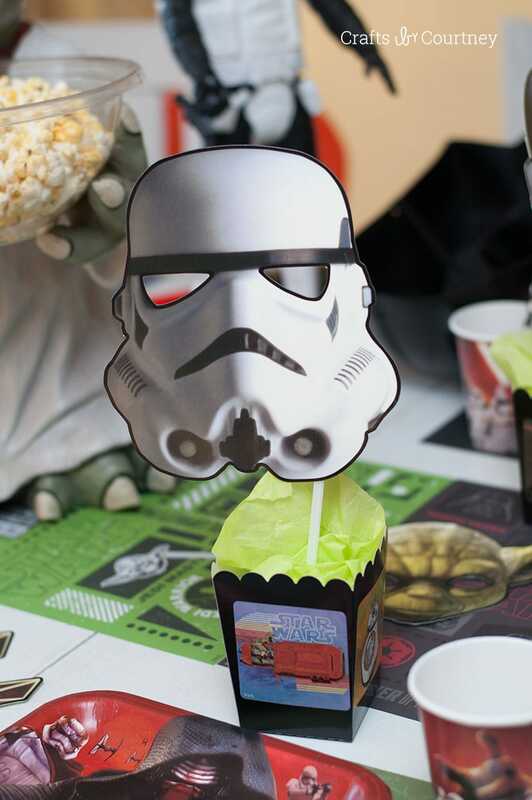 I found some simple black popcorn boxes, but I added some Star Wars stickers to give them a more custom feel. Adding characters you already own is a great way to decorate and save money. When I did my son’s dinosaur party a couple years ago I used all his dinosaurs to help decorate for the party. They really help make a statement. 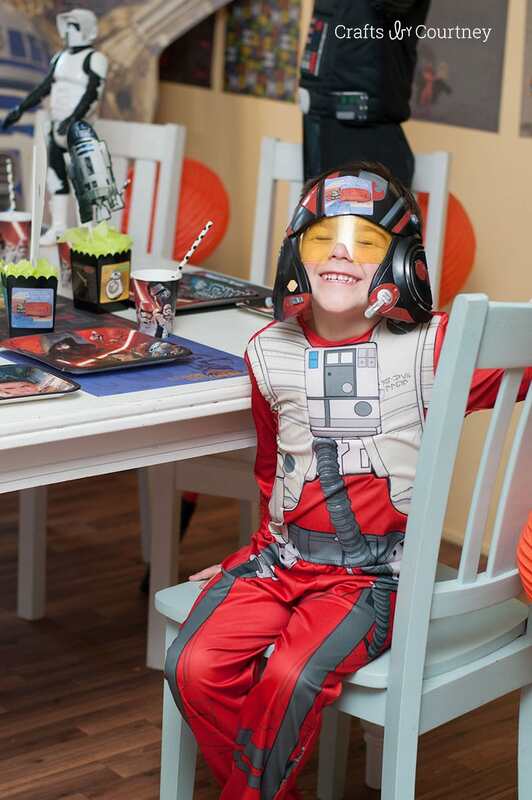 The boys of course had to put on their Star Wars Halloween costumes for the party! I think the pinata was the kids favorite part of the party. Since it’s pretty cold outside right now we decided to keep the pinata inside and hang it above the table. The kids can whack at it and all the candy can fall on the table. 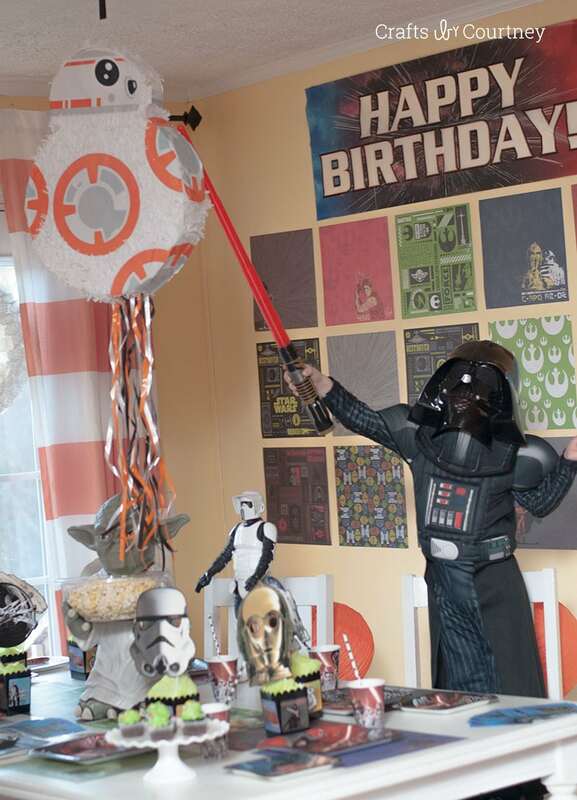 We pulled out our light sabers to give that pinata a good whack! 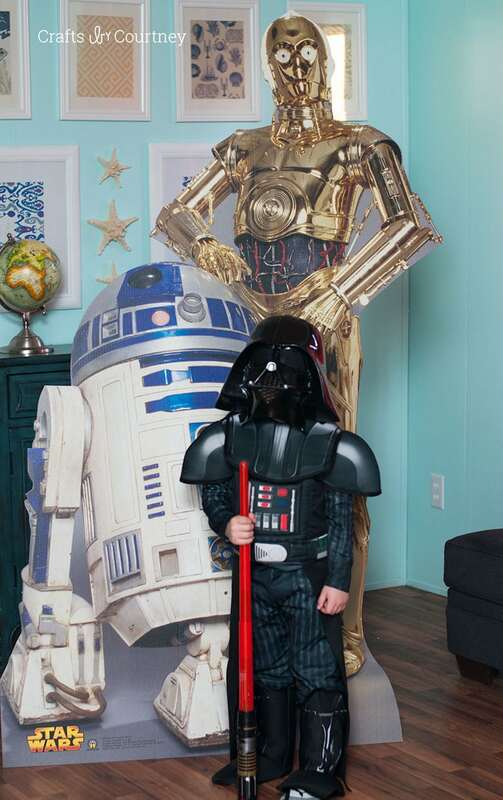 We finished off the party, by letting the kids pose with their favorite Star Wars characters. 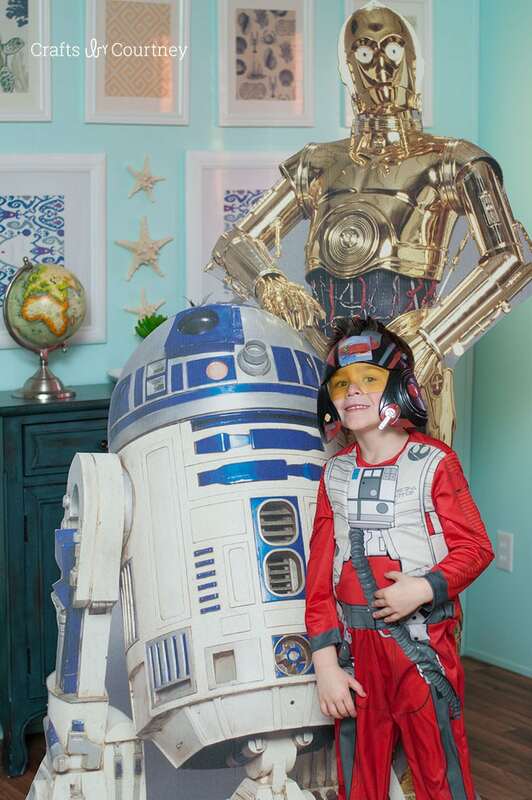 R2-D2 and C-3PO are my boys favorite, who doesn’t love them right?! Also with all my parties I love having the kids make a fun craft to take home. 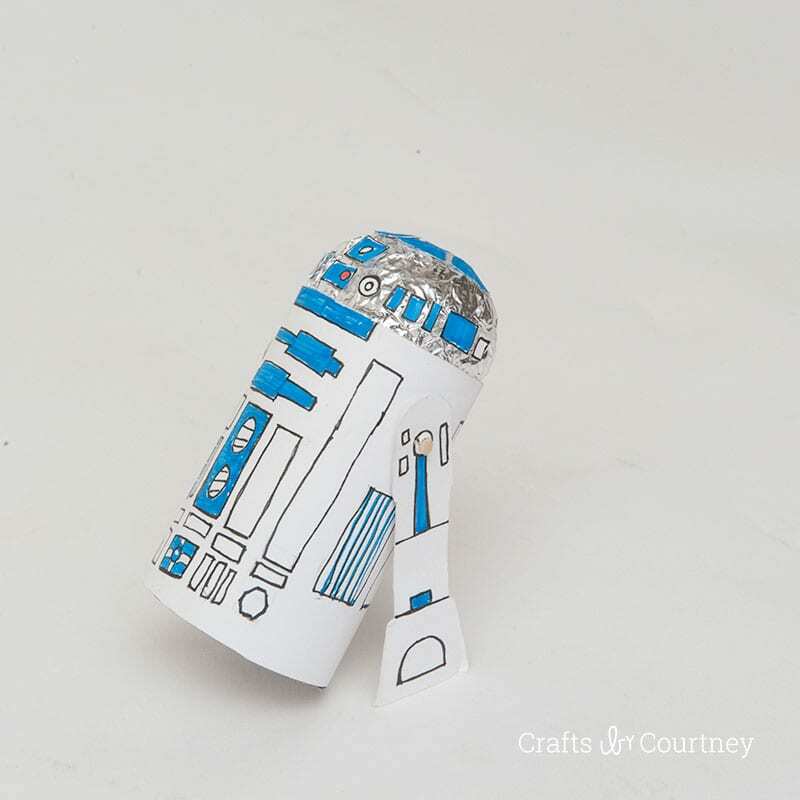 Get the full details on this R2-D2 toilet paper roll craft from my book, 101 Things to Do While You Poo. My kids had a blast making their R2-D2. 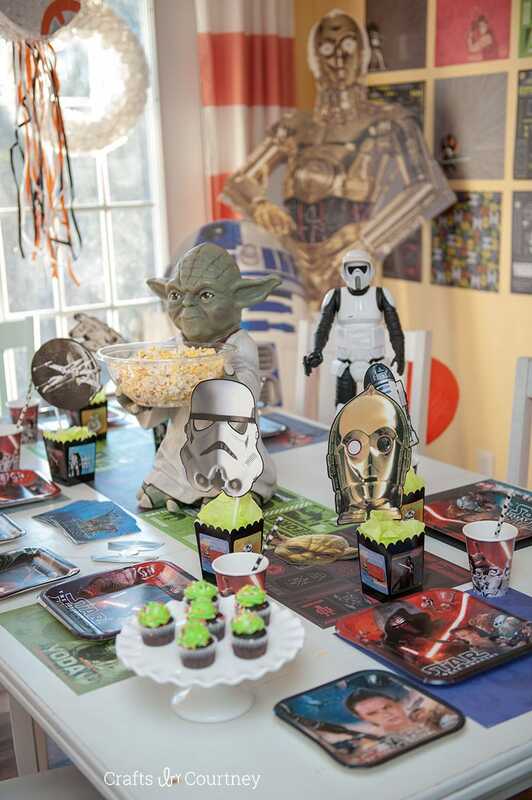 I hope you can find some great inspiration from this Star Wars party! I had a lot of fun putting it together, it’s always so rewarding seeing the kids faces when they see a new party. 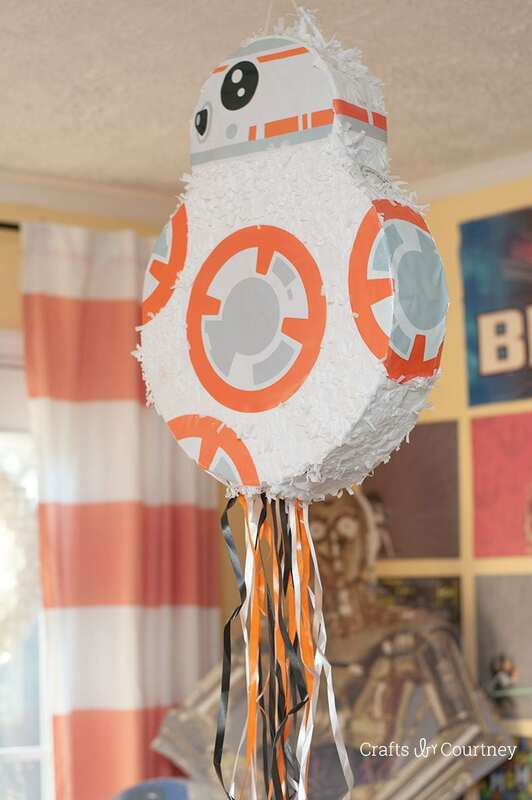 Looking for more DIY Party Ideas for Boys, then head over to this post. 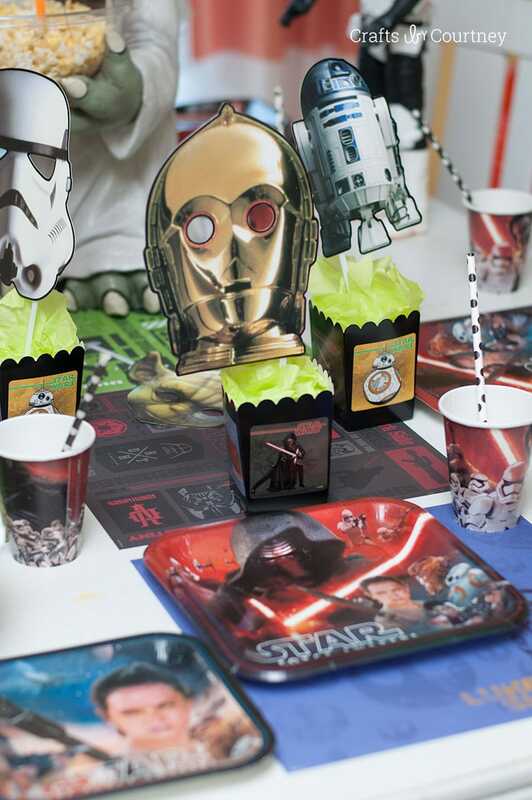 I have rounded up my top favorite party ideas for boys.